IHG® (Intercontinental Hotels Group®), one of the world’s leading hotel companies, is proud to announce the opening of Holiday Inn® Warsaw City Centre. Located on the border of Śródmieście and Wola at the junction of Żelazna, Złota and Twarda Streets, the hotel is an excellent choice for both business and leisure guests. Almost undergoing a complete rebuild after the war in 1945, Warsaw is fast becoming a destination for tourists from around the world. The city holds a story of how residents of Warsaw worked to reconstruct their city in part from the paintings of the Venetian painter Bernardo Bellotto, making it the perfect European weekend city escape for all. Opening under a management agreement with UBM Polska, the 256-room hotel is inspired by the legendary New York Flatiron office building. It features the new Holiday Inn® Open Lobby which was created to transform the traditional hotel lobby format by combining the front desk, restaurant, bar, lounge area and business centre into one open, cohesive space, while refreshing the design to give it a more contemporary feel. The concept has been established by understanding how people use space at home to give guests the most flexibility, whether they’re looking to eat, relax, work, or have fun in one integrated space. The Open Lobby at Holiday Inn® Warsaw City Centre boasts an all-day dining menu and 24/7 coffee shop, which gives guests and locals the flexibility to work in comfort at any time of the day and stay connected with complimentary Wi-Fi. 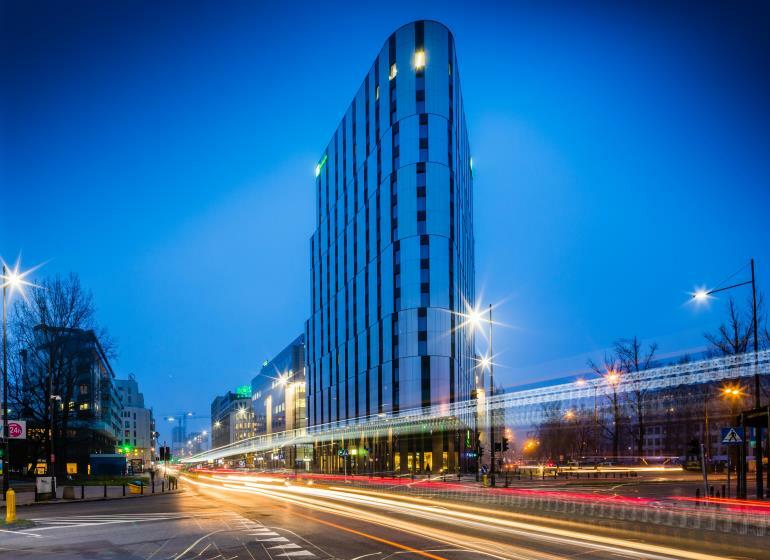 Holiday Inn® Warsaw City Centre has dedicated the entire first floor of the hotel to the meetings, incentives, conferences and events industry. With four professionally equipped conference rooms connected to the foyer, the area can be adapted depending on the nature of the meeting and the needs of the client. There is also a large conference room of 80 m2 and three smaller rooms, each size of 30 m2 which can accommodate up to 130 people. Guests at Holiday Inn hotels can take advantage of IHG’s Lowest Price Promise – a guarantee that guests will get the lowest rate when they book directly with IHG® Rewards Club. Rates for a standard double room start from €60. Next articleEda Ozden: How to Survive the Marketing Jungle?